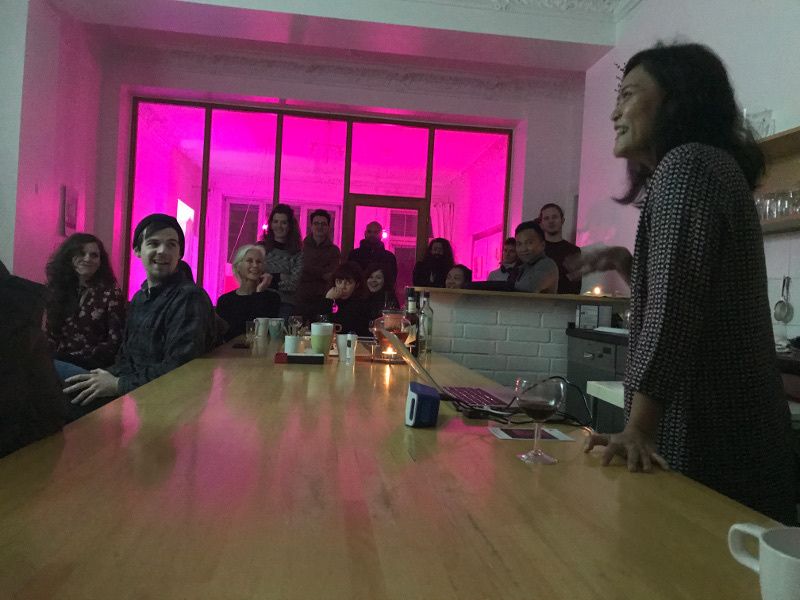 An image from Jean Claire Dy’s artist talk and film screening at Takt’s Tapir gallery. I sat down with Filipino filmmaker Jean Claire Dy at the end of January to ask her some questions about her residency with TAKT. Dy is currently working on a new screenplay that builds off of her last film, “Paglubad,” a film that Claire screened in Tapir Gallery during her stay. Her work deals with the lasting trauma of the Philippines’ conflict in Mindanao during the 1970s. In our interview, we talk about community, imaginary maps, and how Berlin inspires her as a city confronting its traumatic past. Tell me a little bit about what you’ve been working on here at Takt. I’ve been working on a screenplay tentatively titled “Whatever Happened to Malik?”. It’s a screenplay that explores violent extremism and why people join it and why people shun it. It’s going to be set in Marawi City after the war—it’s a city in the south of the Philippines that experienced war last year between government forces and ISIS-inspired Maute group who wanted to take over the city in May until it ended late in the year. Basically, the main character is the same character who was in my other short film, “Paglubad” (Unravel) so the screen play is part of a three part series. The story is told in multiple narratives. It will try to also explore the fallibility of “truth telling” as the film will be told from different points of view. The main character will still be this documentary filmmaker named Ligaya (the main character of my other short film Paglubad) who goes into Marawi after the war to shoot a film that searches for the truth surrounding her boyfriend Malik. It is a story within a story. Some of those whom she interviews say Malik joined the Maute group to fight, while another narrative says he escaped. My preoccupations in terms of storytelling these days falls under the theme of unspeakable trauma and the desire to talk about it. For instance, in my past film, “Paglubad,” I focused on the atrocities done during the conflict in Mindanao in the 70s. Mindanao is an island South of the Philippines, which has experienced protracted conflict through the years. “Paglubad” was my way of opening up that dialogue or engagement between two islands (Panay and Mindanao) in the framework of “dealing with the past” in a more compassionate way. Not to open up old wounds and incite anger or misunderstanding, but in a way to understand why things are the way they are. We continuously explore ways to tell stories effectively and efficiently to inspire people to move and think, to find solutions to problems, to achieve a sense of social justice, to dialogue, to become better at interacting with one another and the environment they live in. There have been a lot of stories about the conflict in Mindanao. And I feel inadequate to comment in a prescriptive nature what should be told. But in my opinion, most narratives of conflict always tend to tell stories in the framework of truisms, and “large” narratives that tend to frame the conflict as “black and white.” Much of the discourse on conflict is always about groups and institutions and rarely about the “little stories” of connections, bonds amidst the divisiveness. How is making this film different than the last film? Well, it’s different because I am still writing this screenplay. It’s different because I’m playing with a different structure. The similarity is that both films are not linear, but this new one is more nonlinear. Also, the context is different. I’m writing it in a foreign country so I have a lot of distance. I am able to imagine so much because I am not in my country—I’m in Berlin. So it’s a very different process. I didn’t have an outline so I just wrote non-linearly and then later on put them all together. Can you tell me a little bit more about how distance from the Philippines, how traveling in general, affects your art? That’s a really good question because I travel so much! There are so many things that I like about the distance — if I don’t want to be in that state where I am really immersed in the story that I’m writing, I can leave it right away. For instance, in Berlin, I can go out in the city. At the same time you are also seeing a lot of things and experiencing a lot of things, and somehow you’re like, “I want that in the story!” You see something that is not culture-specific, but it is something that reminds you of something. And I am inspired by experiencing something really new. That distance helps my imagination. Talking to people who really don’t know the story that I’m writing or the art I’m doing, they are able to offer you a different way of looking at it and you learn something from it. When I am traveling, I am always aware of my subject position as a hyphenated female. And I embrace it wholeheartedly. I always don’t want to lose track of that awareness when I do my work. Even when I am doing fieldwork in Mindanao through the documentaries Manuel Domes and I are finishing, I am conscious that I am female, with Chinese descent, and most of all a settler. And I problematize that positioning in terms of the lens I am using to tell a story. As a feminist, I want to try to be able to ensure female representation that veers away from cinematic stereotypes of women. As a third generation Filipino-Chinese, whose roots can be traced also to Mindanao (my grandfather migrated to North Mindanao from Southern China), one of my preoccupations has been to deal with the history of this identity and I have started with my experimental work, “Walay Naa Diri” (There is Nothing Here), in 2015, which is a work that uses footage I culled from traversing both worlds: China and the Philippines. I really like this feeling of uneasiness when you’re traveling. You’re always on your toes, everything is so clear. You’re so observant and your senses are open. Exactly, you’re so present. That helps my art because it makes me focus. Compared to being at home, where everything is so comfortable and so familiar. So the strangeness actually helps in my art. What has inspired you here in Berlin? I like sitting waiting for the train because I like the sound. I listen. And just a few days ago I watched “Wings of Desire” because it was one of my favorite films and it made me learn so much about Berlin. Also, Berlin, and all of Germany, has been through so much in its history. They are able to deal with the past very systematically. In my understanding, the teaching of history in Germany is very institutionalized. There’s this term that a friend of mine told me about: Vergangenheitsbewältigung, which is a “struggle to overcome the past”). It points to processes that have become key in the study of post 1945 German literature, society, and culture. That’s inspiring for me, considering what my country is going through as well. These days, in my country, I could generally say there’s a strong desire to turn our backs from the past and concentrate on the present because of the precarious histories we face. There’s constant revisioning of history: a dictator was given a hero’s burial for instance. But our history has so much to say. This is why these days, I am inspired by little known parts of history (historicities) in my country. The kind that people don’t want to talk about. I also really like meeting new people in Berlin. I really like the people in the residency, honestly and truly. Just being able to share a space with people who are also doing art. You know, having that time to really be with my art and my people, that you don’t have when you’re working full time. I also like the parks. There’s something about Berlin that makes you want to see more outside of it, but at the same time you’re in it. I find it really strange. It’s not a city that you fall in love with right away, but it grows on you. It really creeps on you and you don’t know it. I just felt that way. In just observing people, I notice that every time — I’ve been lost so many times here! — People are so helpful, they help you try and find your way. And I was at the Jewish Museum yesterday and I saw this curatorial note for one art work, and it said something about how being lost in geographical space, say in the city, allows you to create a map for yourself. That’s what I feel. That’s inspiring for me in Berlin because I learned that I created a map for myself—and that’s my experience in the city. But at the same time, it’s also a map of your emotions, of your experience in it, and somehow that also inspired a possible artwork that I’m going to be doing. I’ve been also playing with those themes of geography and getting lost. In my short film “Paglubad” there’s a line that the voice-over says and it goes “but cartography is not just the act of tracing borders, it is also mapping the blurred interstices of emotions.” I’ve been obsessed with this idea for a long time. In 2015 I made a two-channel video installation based on geography and getting lost (because maps are there for one to get lost if you come to think about it) inspired by the quote above and the poem by Lee Young Lee titled “In The City in Which I Love You.” Berlin has inspired me to make that into a series of video installations about the city, and how by getting lost in it, one also is able to create one’s own map. Something like that. I haven’t thought about that before: that your work deals with political turmoil and because Berlin is a little bit further out from that, Berlin could be really inspiring for your work. Yeah. Berlin also has a lot of history that is really chaotic and Germany went through so much—so there is that similarity. For me, it is very instructive that the people were able to deal with that past in a very constructive way. Talking to Germans about the holocaust, they are dealing with that traumatic and painful task by verbalizing it. I could see that even when I went to the Jewish Museum. Then they are able to talk about it. In a sense, that’s connected to what my work is about. And then by making the work, you’re talking about it. How has your time at Takt shaped your project? I really like that the program is loose, in a sense, because I was expecting to have such a rigorous program that I would be pressured to come up with something right now, and so on. And I don’t function that way as an artist. I really want to take my time, work at my own pace. I really like that. Being at Takt, just being with the residents, all of our interactions. It is so cool that there are other writers here, too. I’ll talk to Petra about her process, see her map of her story and I think, “Yeah, I’ll do that.” And it helped me so much! And then the critique with David—he suggested a lot of things that made everything so clear for me, that this is what I’m going to do. I’m so grateful also that Takt gave me a time and space to screen my work and have an artist talk because that’s the first time I’ve shown my film internationally. And it was so nice that it’s a diverse group of people. I wish I could have stayed longer!